Packaging at Goudas Foods - Commercial! Yes, we know that packaging information comes with its secrets! But Goudas Foods is not afraid to reveal it all, just so the whole world can see that quality is our first concern! This commercial demonstrates Mr. Goudas commitment to quality and consumer safety in the packaging process. Although we take all necessary and redundant precautions, we still ask that you thoroughly check your packaging for foreign objects. Click here to see some of the precautions taken by Spyros Peter Goudas during packaging of rice or beans. For more information on Rice Products, please click here. Spyros Peter Goudas Lima Beans! Another magnificent product has arrived: Lima Beans in a can! Hand picked and hand packaged to avoid damage and ready to eat. The lima beans from Mr.Spyros Peter Goudas are delicious! Serve with extra virgin olive oil, lemon, and chopped onions. Enjoy alone or as a sidedish. Either way, you'll definitely love them! the Hyatt Canning company. This product substitutes Green Pigeon Peas that was introduced in July of 1972 for the ethnic market. Sweet peas is a unique product for the Canadian taste, so he thought it was a good idea to find the best location to grow Sweet Peas in Canada. Mr.Spyros Peter Goudas has high standards as far as size uniformity, taste, texture, and overall appearance. After almost two years of research, the sweet sigh of releif, and tears of joy came to the face of Mr. Goudas having perfected such a product in Canada. In the years to come, many companies came to find out that the Mr. Spyros Peter Goudas sweet peas are exquisite and unique. The imitation brands started rolling out one after the other. Some of these brands do not pay close attention to detail as does Mr. Goudas. Mr. Goudas Whole Riped Tomatoes! 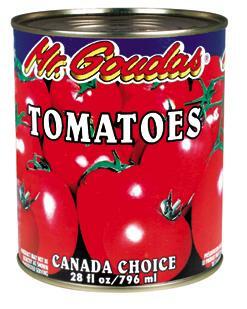 Mr. Goudas has now made available on the market a great product: whole riped tomatoes! The following commercial shows how perfectly packaged they are; once you open the can, the tomatoes are ready to use for your cooking. Mr. Goudas has tried to find a packer of tomatoes that would adhere to strict specifications, which would hold the best quality of tomatoes. The specifications would include evapourating the water as much possible from the can and filling it with tomato juice instead. The reasoning for this is so the tomato better holds its flavour. The 813 Club Closes its Doors. After many years of operating the 813 Club, which was considered to be the number one Caribbean and Latin American club in North America. The hot spot where many artists had visited the club and/or performed successfully (for example Rosco and The Rebellion, Plucky and Beril, Bob Marley, Derry Morgan, The Flames, and other numerous artists from Jamaica, the Barbados, and Trinidad), had to close its doors. The 813 Club opened in November of 1970, and for 12 years it was the center of entertainment for many people. The Club was also a non-profit organization, and a great gift every Christmas, to hundreds of children who would gather at its annual Christmas parties. You may want to read the first article written by Pat McNeilly about the Christmas and Easter parties, as well as school graduation parties (all free of charge) at the 813 Club. Mr. Goudas for his efforts and praising his outstanding contribution to the community. With unique ingredients such as a specific variety of crushed peppers, that grows only in the Caribbean and specific parts of Central America, as well as papaya (a specific species), along with parsley and celery that blends in perfect harmony, this hot sauce is indeed unique. This product finally arrived in Canada, not only to satisfy Trinidadians, who according to Mr. Goudas are the hardest consumers to please in the world, (if it is not right, they would say it right to your face). Anyone can greatly appreciate this product once they try it. The leading creator has left forever. On the 18th of January, on the date of his birthday. 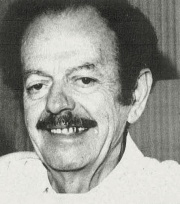 He passes away at a London Hospital. Vassilis Tsitsanis, Greek singer,composer, versifier and a masterly craftsman of bouzouki of the early years of Greece was born in Trikala. During his junior-high school years he also learned violin, "Sinnefiasmeni Kiriaki" one off the most popular songs. He discovered new voices, which serve his songs and bind with him: Marika Ninou, Sotiria Bellou, and Prodromo Tsaousaki. He composed his first songs at the age of 15 and at the end of 1936 he moved to Athens in order to study Law. He worked in taverns in order to acquire income. At the time Mr.Spyros Peter Goudas was also working in one of the taverns as a busboy. The first shipment of scented rice arrived in Canada. 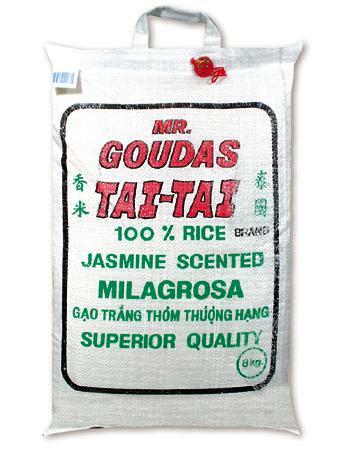 (especially from the Spadina and Queen area which was called Chinatown), Mr. Goudas finally decided to make arrangements in Thailand, so he would be able to select the best quality of scented rice and import it to Canada. Mr. Spyros Peter Goudas Crushed Tomatoes! Mr. Spyros Peter Goudas Crushed Tomatoes contain only perfectly ripe tomatoes as the main ingredient, crushed to the proper size for your cooking work of art. Canned with the most stringent, hygenic procedures to reduce the likelyhood of moulds, bad or sour tastes. Spyros Peter Goudas opens the distribution center in Ville Lasalle to accommodate the Montreal stores, it will also service ethnic stores in the Ottawa Valley area.